How to Install dryer vent duct, vent terminations, lint trap & booster fan specifications & warnings. This article series describes good practices for clothes dryer vent installation, lint traps, wall vents, filters, and screens. We include a list of 32 clothes dryer fire safety hazards and other clothes dryer installation or maintenance mistakes that are either unsafe or that interfere with effective, economical dryer operation. We discuss types of dryer vent ducting and dryer vent doors or opening protection devices. We explain and illustrate problems that result from improper dryer vent installation design, materials, routing, and filtering including dryer vent clogging, clothes dryer fire hazards, building moisture and mold problems, and increased clothes dryer operating costs due to poor or blocked dryer vents. 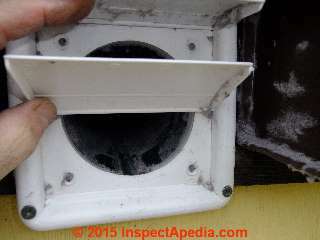 Our page top photo shows a clothes dryer vent that we inspected in a building crawl area. The sagged dryer vent was completely blocked with water from condensation in the sagging flex-duct line. At above left we show an improvement in clothes dryer venting at the home of my daughter Michelle, though the installation looks a bit sloppy. Mishee used metal ductwork for smoother vent interior surfaces and less lint accumulation, and the dyer vents directly to the outdoors with a minimum number of bends or turns. Proper installation and maintenance of clothes dryer exhaust vents, filters, and lint screens are important for safety (avoiding fires) as well as important in keeping the operating costs of clothes drying down to a minimum by making sure that the dryer operates efficiently. As we discuss in more detail in the article below, among house fires that occurred during 1998, approximately 15,600 fires, including 20 deaths and 370 injuries were traced to clothes dryer fires. And a clothes dryer whose venting is blocked will require much longer operating time to actually dry the clothes, increasing dryer operating costs as well. 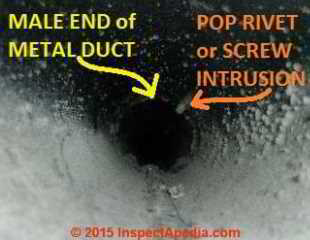 Our clogged dryer vent duct photo shown at left illustrates just how much lint can collect inside of even a smooth metal duct over the course of years of dryer use. Any defect that restricts air flow through the clothes dryer exhaust vent system, by slowing the flow of air through the dryer intake, through the wet contents of the dryer, and out through the exhaust vent, increases the length of time that the dryer has to operate before the clothing or other dryer contents will be adequately dried. Longer dryer operating time means higher energy costs for the laundry system. We have seen laundry dry time decreased by as much as 75% when we replaced a clogged flex-duct dryer vent with an open, clean, straight and smooth metal duct system. Here we provide an expanded version of the U.S. CPSC's List of Clothes dryer fire hazards: Signs that a clothes dryer vent or laundry vent installation may have problems or risk a fire. Our photo above-left shows an upper floor clothes dryer vent through a building gable end wall. The lint on the roof below the vent opening may not itself be a problem but its presence made us worry that because this vent opening is difficult to access the system could easily become clogged with lint, leading to higher dryer operating costs and risk of a building fire. Proper clothes dryer exhaust venting installation, routing, materials, and lint screening are important to prevent building fires, excessive clothes drying time and dryer operating costs, moisture damage buildings, decay, rot, or insect attack on the structure, saturation of building insulation, and building mold contamination. The temperatures measured inside the heater box, heater intake, and intake into the tumbler increased when the exhaust vent was partially blocked or fully blocked. The temperatures inside the tumbler, blower and exhaust vent decreased when the exhaust vent was partially blocked or fully blocked. When the exhaust vent was 75 percent or 100 percent blocked, temperatures in certain areas inside the dryer increased significantly. Seals in the dryer’s interior exhaust venting may not be adequate to prevent linty air from escaping into the dryer’s interior. Lint that accumulates on the heater housing can easily ignite under conditions of a failed high-limit thermostat and a blocked exhaust vent. Lint accumulating near the heater intake can ignite before the high-limit thermostat switches the heater element off. Lint ingested by the heater and embers expelled from the heater outlet can easily ignite additional lint or fabric in the air stream, resulting in additional embers in the dryer system and exhaust vent. The high-limit thermostat may prematurely fail when subjected to high ambient temperatures. The clothes dryer safety sketch at above-left (US CPSC ) illustrates a typical clothes dryer installation and outlines a number of fire and safety recommendations. Our photo above illustrates what we found during a building addition project when we opened the dryer vent hood that had been mounted on a low slope roof. The dryer duct was nearly 100% blocked with lint. The homeowners had been operating their dryer only on its "low heat" setting for several years after observing that the clothing was always very hot at the end of the dryer cycle. Burning smells or odors: if you see smoke or if you smell a burning odor near the dryer or at the dryer vent termination opening at the building exterior you are risking a building fire. Watch out: turn off the clothes dryer (and any booster fans) immediately. Then check further for evidence of fire, heat, smoke. If you suspect that there is an actual fire, get everyone out of the building and then call your fire department. Visibly blocked laundry dryer vent screen openings at the dryer duct outlet. Check that the clothes dryer vent terminating screen is not blocked and check that movable flaps or other parts that should open when the dryer is in operation do in fact open fully. Booster exhaust fans for clothes dryer venting and auxiliary or secondary lint filters on clothes dryers are permitted and can improve dryer performance, reduce lint accumulation, and can permit longer dryer vent duct runs. Check with your dryer manufacturer and your local building official before adding such devices. In any case, a dryer vent system and booster fan requires periodic inspection and maintenance (cleaning). If you hear buzzing or other noises at the vent fan it's probably in trouble and needs attention. See CLOTHES DRYER VENT BOOSTER FANS for details. Watch out: if a clothes dryer system is relying on a draft boosting fan for safe operation (say for a long dryer vent duct run or a run with many bends), be sure that the fan is operational. Otherwise the system is unsafe. Clothing is still damp at the end of a dryer cycle of normal duration or abnormally long time required for clothes to dry. Crushed or crimped flexible dryer vent ductwork or sagged dryer ductwork collects moisture, water, lint, and obstructs air flow. 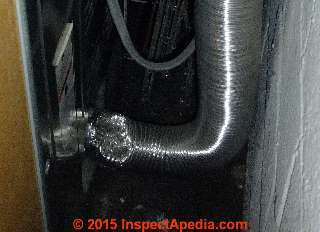 An operating defect like the squashed flexible metal dryer duct shown above is a fire hazard. Take a look behind the dryer at the condition of the duct and its connections. Dryer Controls / Switches Not Working: dryer switch or control failures that can lead to high temperatures include: the humidity sensor, the dryer's temperature control system, the clothes dryer blower motor/fan, the dryer timer control, the dryer shutoff control switches. If any of these clothes dryer controls fail to work properly a result may be excessive or unsafe clothes dryer temperatures. Dryer exhaust vent disconnected: check the back of the dryer: if the exhaust vent has become disconnected you'll probably see lint blowing all over the place. But if the exhaust vent has become disconnected elsewhere in its routing to the building exterior you may miss that potentially dangerous condition unless you inspect the entire run. Start by checking for good dryer air output at the exterior side of the dryer vent termination. If airflow is weak there the system is unsafe. Dryer exhaust vent under-sized: the clothes dryer vent diameter should be no smaller than 4" in diameter or the size of the dryer outlet. An under-sized dryer exhaust vent restricts air flow, overheats the dryer, and may be unsafe. See CLOTHES DRYER VENT INTO ATTIC? Dryer exhaust vented into a crawl space, or even worse, venting the clothes dryer into an inaccessible crawl space. Nobody will see the trouble brewing there until conditions of mold, leaks, rot, insect attack, odors, slow dryer operation, or a dryer fire produce conditions bad enough that they're apparent without peeking into the crawl area. Repairing or replacing clogged, sagged dryer exhaust venting that was routed through an inaccessible crawl space will leave the building owner and repair contractor saying uncomplimentary things about the original dryer vent installer. See CLOTHES DRYER VENT INTO CRAWL SPACE? Dryer exhaust vented into the building interior: In addition to avoiding venting in to attics or crawl areas, you also should not vent the dryer exhaust into any interior room nor into a wall cavity. Dryer exhaust vented into a chimney or into HVAC ductwork: don't do it. Venting a clothes dryer into a chimney is unsafe, risking fire or fatal carbon monoxide poisoning. Venting a dryer into HVAC ductwork clogs the HVAC system and also risks blockage and fire in both systems: the dryer and the HVAC air handler. Hot dryer venting or hot clothing: Noticeably hot clothing found at the end of the clothes dryer operating cycle indicated a clogged lint filter, clogging in the dryer's air flow passages, or possibly a clogged outlet vent: all fire hazards. Increased or excessive clothes dryer operating time needed to actually dry the laundry - could be due to a failed dryer heater element (electric dryers) but most-ofte is due to a blocked dryer vent. Weak air flow: Feeling at the dryer exhaust vent outdoors you do not see that the vent is opening when the dryer is operating, is not opening fully, or has weak air flow. Also note that the vent should close when the dryer stops operating. Sagged flex-ducting used for laundry dryer vent exhaust collects lint and possibly condensation in the form of accumulated water. Watch out: any blocked dryer duct invites a dryer fire. Our photo above shows water pouring out of a sagged flexible plastic clothes dryer vent after I poked a drain hole into the vent's bottom. Condensation of moisture out of warm moist clothes dryer exhaust can be expected inside of the vent line when it passes through cool spaces. 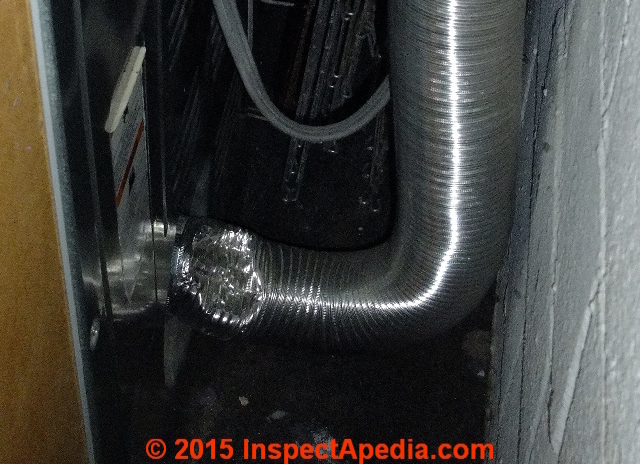 The best solution for a sagged, water and lint blocked dryer exhaust vent line is to replace the line with solid metal vent ducting and elbows. Be sure that horizonntal portions of the new dryer vent slope towards the vent termination to drain any condensate outside rather than back into the building. Lint filter missing or clogged in the clothes dryer. Do not operate a clothes dryer without the lint filter in place as that accumulates lint inside the dryer body, increasing the risk of a clothes dryer fire. And remember to clean the dryer's built-in lint filter at each dryer use. Failure to keep the dryer lint filter clean increases the dryer temperature, possibly to unsafe levels, and by blocking air flow it also increases the time required to dry clothes, thus increasing the dryer's operating cost. Lint and debris collecting behind and around the clothes dryer may indicate that its exhaust vent is blocked. Lint build-up inside the dryer and at the dryer back or bottom can not only obstruct air flow but such blockages form a common fire hazard. A blocked dryer exhaust vent forces lint back into the dryer where it accumulates. Lint clogging at the dryer vent flap or louvered opening can prevent the louver from closing fully, inviting rodents, birds or other pests into the dryer duct system: a fire hazard. Check that the flapper door or louvers close fully and if they don't clean away lint with a soft brush. Below I'm checking for lint blockage of the two louvers that close this dryer vent terminal when the dryer stops: I want the louvers to open and close freely (opening to vent fully and closing to make it harder cold air or worse, cold animals to invade the duct system). You can see two clean streaks at the bottom of the metal duct just inside the opening: I wiped away lint to estimate its thickness in the dryer vent system. Lint trap is installed on the dryer vent system. Lint traps are potential fire hazards. Long clothes dryer venting duct runs or too many elbows or bends in the dryer ducting may violate the clothes dryer manufacturer's installation guide and warranty and may be a fire hazard as well as causing overheating or longer dryer run times and increased dryer operating cost. Most manufacturers want the dryer vent run length to be 25 feet or less. Some manufacturers describe "long run" dryer vents of much longer distances, using specific vent materials, routing specifications, and perhaps booster fans - all potential fire hazards. In calculating the clothes dryer vent run length, reduce the allowable total distance from dryer outlet to exterior wall vent by 5 feet for each 90 degree elbow and by an additional 2.5 feet for each 45 degree elbow in the vent duct system. You can exclude the "transition duct" or periscope (if used) that connects the dryer outlet to the exhaust duct system itself. Note: Fantech notes that "The 2012 International Residential Code (IRC) is pretty specific when it comes to dryer exhaust venting. The maximum length for dryer exhaust duct cannot exceed 35 feet from the dryer location to the wall or roof termination. " (Fantech 2012). Note: some high power and commercial clothes dryers are rated for "long dryer vent runs" and may handle longer vents than 25 ft.
Screws in the dryer vent connections that protrude into the vent or duct interior are not an approved duct connection method as lit collecting on those points can clog the system: a fire hazard. Use a foil or metal duct tape instead. 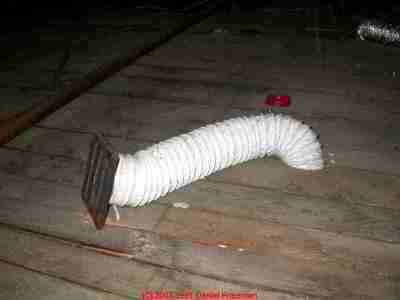 Where dryer vent duct support is needed use external strapping or clamps. 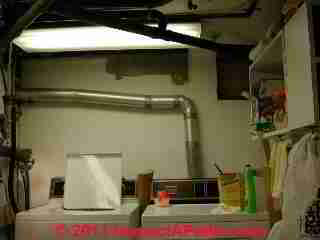 Wrong dryer venting material: Beers (2003) points out that the common flexible white vinyl ducting sold at some outlets for dryer venting does not meet the Underwriters Laboratory Standard for dryer venting and is a fire hazard. UL required metal (or flexible metal) clothes dryer venting. Such flexible vinyl dryer ducting may also violate the dryer warranty. Metal dryer vents should be made of aluminum, stainless steel, or galvanized steel. Recommendation: use only clothes-dryer manufacturer-approved and in Canada CSA approved, or in the U.S. U.L. 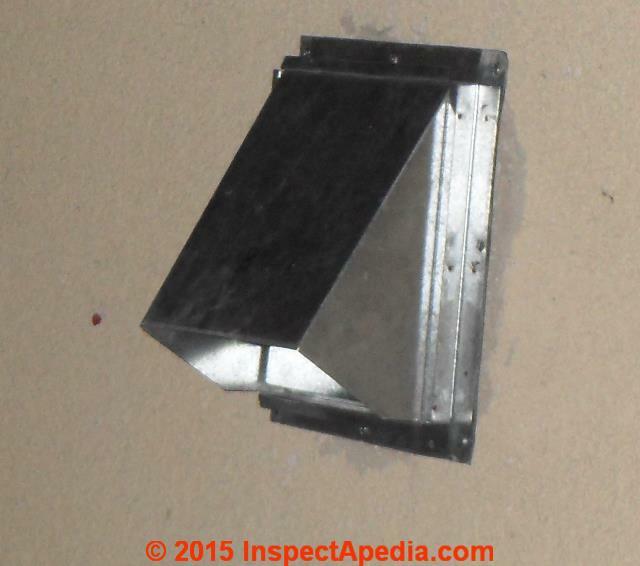 listed/approved clothes dryer vent ducting and duct closures or doors. 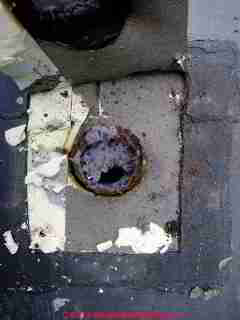 Dryer vent sections installed wrong-way: metal dryer vent sections should be connected with the male or "inserted" end of each vent section at the outlete or downstream end of the exhaust vent. This ordering reduces the catchment of lint on to the exposed ends of the dryer vent sections inside the duct system. In our photo above the duct sections have been assembled in the proper order: you can see that lint is not collecting at the intersection of the male and female duct section ends (yellow arrow). Though we are also a little worried about screw or pop rivet intrusions into the duct system (orange arrow) we see no lint stuck on that fastener. I suggest that placing ducts in the right male-female orientation may be more significant in slowing the rate of dryer lint clogging. Dryer vent terminates too close to other mechanical systems or building features such as a gas meter. Keep the exhaust vent at least 3 feet away from a gas meter or other outdoor mechanicals including electrical receptacles. Clothes Dryers Vent into the Attic OK? No. See CLOTHES DRYER VENT INTO ATTIC ? Booster Fans for Long Clothes Dryer Exhaust Vent Duct Runs? Booster fans are sold to help vent dryer exhaust vent products, especially where the vent ducting has to make a long or circuitous run. They require periodic inspection & maintenance.
. 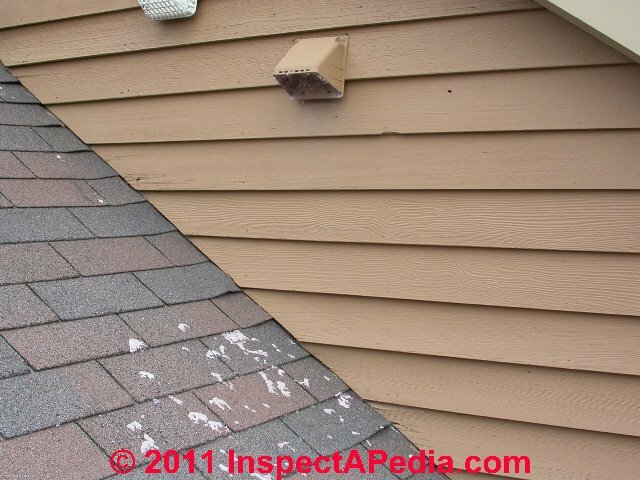 In addition some dryer vent terminations and covers, particularly those that rely on a flapper (photo above) that is opened by the moving exhaust air, can become stuck in the open position, inviting dangerous vent line clogging by entering birds or insects. Air-Operated Exterior Wall Vents for clothes dryer vent lines are available at hardware stores, building suppliers, and from some online sources. These devices use a movable plastic cylinder that lifts to permit venting of the laundry dryer exhaust when the dryer is operating. Also see CLOTHES DRYER VENTING FAQs for more about dryer vents that resist lint clogging, and about use (or recommendations against using) supplemental lint filters in dryer vent and duct systems. Watch out: Clothes Dryer Lint Traps: like the unit illustrated above and sold a variety of manufacturers and online stores are intended to be installed somewhere between the clothes dryer outlet and the dryer vent outlet - these are are also not recommended in some dryer installation manuals, are prohibited by some building codes, and can similarly cause overheating and fires. or select a topic from closely-related articles below, or see our complete ARTICLE INDEX below. APPLIANCES, BARBECUE. "Clothes Dryer." Transfer 403 (1996): 2. Beers, Jonathan. "Dryer Venting." HOME ENERGY 20, no. 6 (2003): 14-16. This article notes that " Once a fire starts, the plastic vent hose burns, spreading the fire." 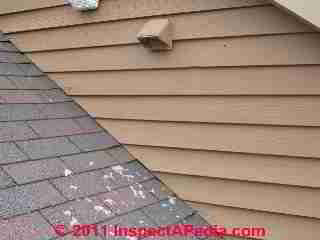 Brook, David M. Home moisture problems. [Corvallis, Or. ]: Oregon State University, Extension Service, 1994. Cheung, Kisuk. Engineering and Design: Clothes Dryer Exhaust Venting. No. ETL-1110-3-483. CORPS OF ENGINEERS WASHINGTON DC, 1998. Abstract: This letter provides basic design guidance for exhaust venting systems for residential-type electric and gas clothes dryers. Flynn, Jennifer D. US Structure Fires in Nursing Homes. National Fire Protection Association, 2008. Franklin, Frederick F. "Survey of electrical fires." FIRE J. 78, no. 2 (1984): 41-44. Geis, Aelred D. "Effects of building design and quality on nuisance bird problems." (1976). Hayden, A. C. S. "Residential combustion appliances: venting and indoor air quality." Environmental progress 7, no. 4 (1988): 241-246. Hoddenbach, Gerard, Jerry Johnson, N. P. S. Chief, and Carol DiSalvo. "RODENT-EXCLUSION MANUAL." Sherman, Max H. "ASHRAE and residential ventilation." Lawrence Berkeley National Laboratory (2003). Sherman, Max. "Residential Ventilation Standard." EETD Newsletter (2001). Wijayasinghe, Mahendra. "Fire losses in Canada: Year 2007 and selected years." (2011). Wright, Frank Lloyd. "Environmental Barriers." New York Times (1953). Continue reading at CLOTHES DRYER VENT INSTALLATION or select a topic from closely-related articles below, or see our complete INDEX to RELATED ARTICLES below. CLOTHES DRYER VENTING at InspectApedia.com - online encyclopedia of building & environmental inspection, testing, diagnosis, repair, & problem prevention advice. 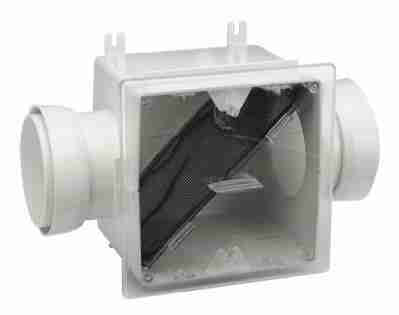 Questions & Answers on bathroom vent fan and fan ducting installation procedures, codes, standards.